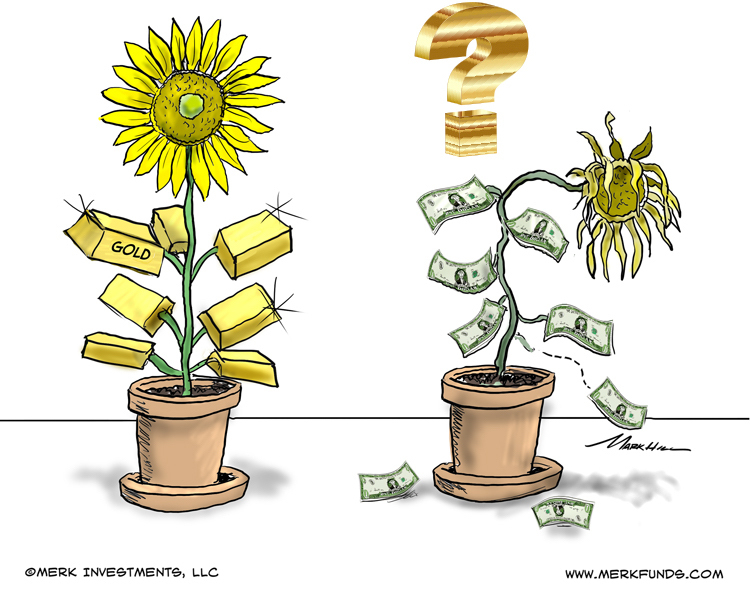 Merk Insights - Gold More Productive Than Cash?! We wonder where all these patriotic investors are hiding. That's because if we look at long-term yields, they are near historic lows throughout the developed world, with many countries showing near zero or even negative yields on governments bonds. Differently said, many investors rather get a negative yield on the safest investments available to local investors (disclaimer: U.S. regulatory point of view, foreign government bonds aren't considered "safe") than invest in so-called productive assets: a corporate bond may qualify as a 'productive asset' if a company uses the proceeds to invest in future ventures; yet, in today's environment, corporations frequently issue bonds to buy back shares. Why do investors prefer "nothing" - as in no or negative returns - over investing in productive assets? And if investors really like negative returns, is gold - that doesn't have an intrinsic return, suddenly attractive? There may be many reasons why investors are on strike. Current low inflation, in our view, is a symptom, not a cause of that. At its core, we believe investors don't think they get rewarded for their risky investments. Our analysis shows that investors in recent decades have - on average - focused on ever more short-term projects. That is, projects that require massive investments with an expected return in twenty years rarely happen these days.